AnonD-97272, 06 Jan 2013I bought the TV out cable for Samsung Galaxy tab 2 3100, connected to TV. But it does not work... morewhere do u bought the tv out adapter for tab 2 7.0. Can u post the link?? use a router that supports 3g dongal and have seemless connectivity this the better option then using sim except certain situations. [deleted post]comparing it to the p6200, p6200 is specwise much better. and at kimstore from facebook, it's cheaper by P2000-P3000 i believe. although it is an older tab, it's faster on paper than this p3100. i wonder why they downgraded this newer version. front camera from p6200 is 2mp, and the cpu is clocked faster. that's why we chose to buy the p6200 for my son. teeth, 06 Jan 2013im also from the philippines, how is it using this tablet? is it worth the money? 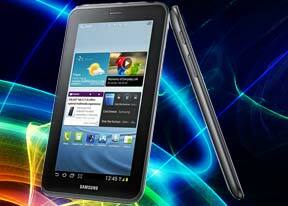 thanks..The tablet is worth in its price itself but compare to the cheap china tablet its depend on your money on hand. I bought this tablet last two days here in the Philippines for about 400 US dollars.When it comes to phone call the sound is low even the loud speaker but other than that the speaker so loud on music and video function.Google Android withdraw its support to adobe flash but you can get some adobe flash to other android freeware apps and some tech forum.The default browser is best on adobe flash same quite also to Opera Browser.The data connectivity with 21 Mbps on HSPA is very reliable,i can play high quality You Tube videos very smooth same also in live tv apps. teeth, 06 Jan 2013im also from the philippines, how is it using this tablet? is it worth the money? thanks..Absolutely, the best thing you’ll ever buy,im here in taiwan and im a filipino. Bik, 06 Jan 2013can any one tell me can we use dongle in tab 2No we cant use dongle on tab 2. 3g is supported only via sim card. AnonD-97245, 06 Jan 2013i would like to order and pay cash, but how? i don't know how, please reply asap I need it as... moreBuy it from flipkart.com as it facilitates cash on delivery option. Anonymous, 06 Jan 2013The advantage of Android to Apple is the adobe flash support but saddenly Google Android with... moreim also from the philippines, how is it using this tablet? is it worth the money? thanks.. The advantage of Android to Apple is the adobe flash support but saddenly Google Android withdraw its support to adobe flash but luckily some tech people got some answer to this problem.Although adobe flash is no longer available on Google Play,you can download adobe flash to some other freeware sites.The MemoExpress Store here in the Philippines added apps when you buy Samsung tablets. I bought the TV out cable for Samsung Galaxy tab 2 3100, connected to TV. But it does not work. On ICS i do not see TV out option.